It never fails to astonish me how long my kids can withstand a game of Rock, Paper, Scissors. Earlier this spring, we waited in line for three hours to get tickets to an art exhibit, and they entertained themselves for at least an hour playing this hand game. Long after myself—and every adult around us—was ready to banish the words “rock,” ‘paper,” and “scissors” from the English language, my kids kept going. Alas, this is not a quiet game. It is often with trepidation that I watch my daughter prepare to work on a picture or a card. She sets out her paper, her drawing instrument of choice, and animatedly explains her Vision to anyone in the vicinity. “I’m going to draw a bird for my teacher,” she says, “because she loves birds.” I smile, but I try not to look too eager…or too stressed…or too anything. I try to look neutral. I attempt to recede into the kitchen—or, better yet, disappear into the basement to throw in a load of laundry—because I know from experience what likely lies ahead. My six and a half year old is rarely ruffled. She goes with the flow, handles curve balls with ease, and loves trying new things. After spring break ate up my last two weeks, I’ve found my way back to writing, and I’m especially glad to be back, because I have a very special new book to tell you about. It’s a book that can be enjoyed simply for the fun, quirky, heartwarming story that it is. Or, it’s a book that can be read as a metaphor for one of the most important examples we can provide our children: that when life doesn’t give us what we want, we possess the power to stand up and change it. It’s a book that boys and girls will enjoy equally, as my two already do. But, it’s also a book that must be shared with our girls. In fact, Marilyn has quickly become one of my favorite picture book heroines OF ALL TIME. If that hasn’t piqued your interest, consider this: Marilyn’s Monster (Ages 4-8) is written by Michelle Knudsen, the same author who gave us Library Lion (need I say more?!). Marilyn’s Monster showcases the same beautiful fluidity of narration, the same perfectly orchestrated dramatic arc, and engenders the same depth of empathy for its central character. Like Library Lion, where a lion listens to stories alongside children at the local library, Marilyn’s Monster is similarly grounded in real, everyday life—with one large, fantastical exception. You see, in Marilyn’s elementary school, every child has a monster. That’s right, a monster. A friendly, playful, benevolent monster. A monster that’s unique to each child in color, attribute, and personality. These monsters aren’t exactly pets (because they don’t require basic care); they’re not exactly imaginary friends (because they’re visible to everyone); and, while similar in personality to their children, they’re not exactly personified extensions of the children themselves. These monsters fill a different void for each child. Maybe the child needs a homework buddy; or someone forever available to clap when they perform tricks on the playground. Maybe they need a monster of enormous proportions to scare off bullies. Maybe, as in the case of Marilyn’s dour, know-it-all older brother, they need a gooey glob of green slime perched under a baseball cap. But here’s the catch. In Marilyn’s world, “Your monster had to find you. That’s just the way it worked.” You never know when the timing will strike. You could be sitting in class one day and, boom, your monster chooses you. Not only does your monster find you, under no circumstances are you to find your monster. No sir! No ma’am! This is simply not done. So, when Marilyn finds herself in the devastating predicament of being the only child without a monster, she is given only one option: she has to sit pretty and wait. She made sure she brushed her hair very carefully every morning and wore pretty clothes and smiled a lot and tried to look very friendly and interesting and smart and fun to be around. She tried to be the kind of girl no monster could resist. But no monster. Even when Marilyn tries to look for her monster without appearing like she’s looking for it—mailing a letter simply for the excuse to look deep into the mailbox—she comes up empty. And that’s when she hears the small, quiet answer of her monster. He hasn’t been hiding from her. Rather, he’s lost and scared and his two delicate golden wings are tangled in the branches of a tree. It turns out Marilyn doesn’t need saving. But her monster does! But my favorite part of this story—the part that makes my heart swell with every reading—is Marilyn’s quiet confidence when she returns home victorious, flown in the arms of her (COOLEST EVER) monster. Haters will hate, and her brother is quick to criticize. “It’s not supposed to work that way,” her brother said. Marilyn just looked at him. She didn’t think he was right about that. She thought there were a lot of different ways that things could work. No more complacency. No more blind acceptance of the Status Quo. No more sitting pretty and waiting for friends or adventure or work or opportunity to come. Daughter of mine, children of the world: here’s hoping that Marilyn will serve as one small example that, sometimes, you have to take life by its monstrous horns and go get ‘em. Review copy provided by Candlewick. All opinions are my own. Amazon.com affiliate links support my book-buying habit and contribute to my being able to share more great books with you–although I prefer that we all shop local when we can! Who’s ready for a good snooze right about now? I’m not talking about the fall-into-bed-eyes-already-closing-ready-to-be-awakened-at-any-time kind of snooze, which is par for the course when parenting young children. I’m talking about a luxurious, heavenly, finest-Egyptian-cotton type snooze…a long, uninterrupted, sleep-in-as-late-as-you-want sort of snooze…a snooze in a silent house, where the only sound you have to worry about is the steady pit-pit-patter of melting ice outside. If that sounds too good to be true, it is. But, for those of us who prefer to live life in the tiny space between reality and fiction, I have a close second. 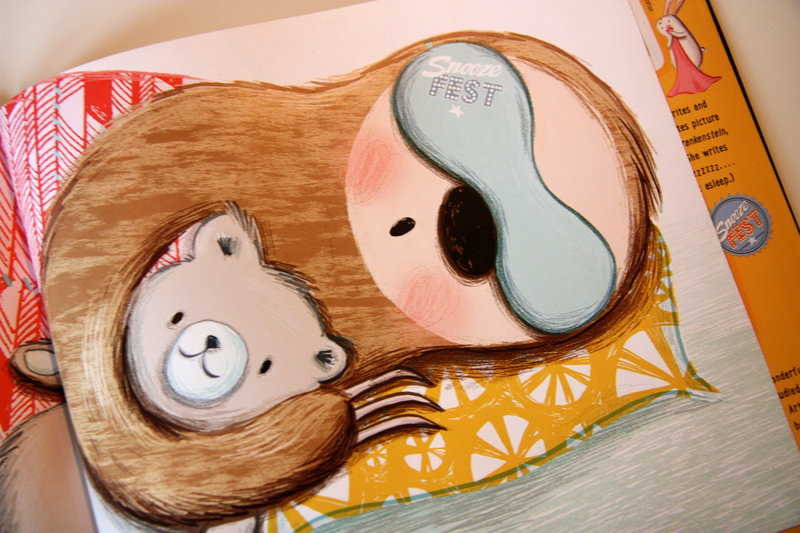 The newly-published Snoozefest (Ages 3-7), written by the always witty and clever Samantha Berger, and charmingly illustrated by British newcomer Kristyna Litten, is a book you can gift with abandon (you know, when you’re not sleeping) to all those kids of parents who shoulda, coulda, woulda be sleeping more. It’s a book that celebrates snoozing. And not just any snoozing. We’re talking snoozing so deep, so restorative, that it warrants its own festival. Welcome to Snoozefest: a Lollapalooza for people who love to sleep (yes, my fellow almost-forty year olds, this is what it has come to). Here’s Snuggleford, checking into the festival (I die over the cuteness). Before the blissful sleep commences, there’s plenty to do at Snoozefest, from shopping for sleep swag, to procuring milk and honey, to cheering at the P.J. Parade (showcasing the latest in sleepy fashions from Diane Vonfirstinbed and Louis Futon). It wouldn’t be Snoozefest without a wide range of musical performances, from bands like Chamomile Rage, Deep Hiber-Nation, and The Nocturnal Nesters (“who play until only the flutist still stands”). Naturally, for optimal sleeping, every animal is required to bring along his or her blankie. You know. A child’s Most Sacred Possession. In our house, this would be my daughter’s “Baba,” a tiny terrycloth square of a blanket with the head of a lamb. While my son rotates through a litany of stuffed animals each night, there’s only ever the same one thing in bed with Emily. Don’t even think of trying to get her to sleep without it. Don’t even think of picking it up by anything other than the top corner of its left ear, lest you be chastised, “SHE CAN’T GET HOT! DON’T LET HER GET HOT!” My daughter tucks into bed each night, thumb in her mouth, cheek gently resting on the coolest, softest corner of her Baba. Pinky and Minky and Gunk-Gunk and Gee-Gee. But back to our heroine, Snuggleford Cuddlebun, who is not easily swayed by the visual, musical, or tactile distractions of Snoozefest. She settles into a hammock in the treetops, high above the crowds and the din of the music, and gets right down to business. She sleeps through it all. It’s all that she wanted from this year’s Snoozefest. dreamy, delicious, and so soporific. Oh, to be this sleep-indulging sloth for just one night! The first time we finished this book, I tried not to sound desperate when I suggested to my kids that perhaps we could have our own Snoozefest RIGHT HERE IN OUR HOME! TODAY! OR MAYBE ANOTHER DAY! “That’s crazy!” my son responded. And then he and my daughter stood up and walked away to go play. “It’s a good book, Mommy,” my daughter added as a final thought, as if not to hurt my feelings. Like this post? Make sure you don’t miss any others! Enter your email on the right hand side of my homepage and you’ll receive a new post in your inbox each week. Review copy courtesy of Penguin. All opinions are my own. Amazon.com affiliate links support my book-buying habit and contribute to my being able to share more great books with you–although I prefer that we all shop local when we can! In the canon of children’s literature, there is perhaps no character more reliable than the bear. When in doubt, put a bear on the cover and little hands will want to open it. In past decades, we’ve fallen in love with bears who have lost their buttons (Corduroy), or lost their mothers (Blueberries for Sal); with bears who have a vivid imagination (Little Bear), and bears who’ve let that imagination run away with them (The Berenstain Bears and the Spooky Old Tree). The trend hasn’t slowed in recent years, as evidenced by these two newcomers, both of which will be guaranteed hits should you have any preschool-aged birthday parties in your future. The premises of Jory John and Benji Davies’ Goodnight Already! (Ages 3-6) and Sophy Henn’s Where Bear? (Ages 3-6) are not particularly novel in and of themselves. Goodnight Already!, starring a Bear who wants only to sleep and his pesky neighbor Duck who wants only to keep him awake, reminds us of favorites like A Bedtime for Bear. Similarly, Where Bear?, about a boy who decides to deliver his pet polar bear to his natural habitat, recalls favorites like Oliver Jeffers’ Lost and Found, or even the darling story that I wrote about during last year’s Polar Vortex. That these may be story lines that you or your kids have heard before doesn’t actually matter. What does matter is that, in both of these new picture books, the comedic timing and the bold, modern art are 100% unique. And 100% fun. I’m including them in the same post because, as my children instantly pointed out, there are striking aesthetic similarities between the two, most notably the flatness of the art and the retro color palettes. In both cases, the art and text are in perfect harmony, playing off each other to heighten the drama on every page. But the best news—and why you should give these as gifts—is that no parent will mind reading them 713 times. In a row. Because, if my children are any indication, this is what will happen. And you don’t want to make enemies of the parents of your children’s friends. Let’s start with Goodnight Already!, which is told largely through the conversational banter between two friends, one exceedingly tired and cranky, and one insufferably over-caffeinated and peppy. Poor Bear wants a long, uninterrupted night’s sleep; and poor Duck wants someone to pay attention to him. Relate much? Hell hath no fury like a Mama being kept from her sleep. Now add to that spot-on repetition, dry wit, and perfectly placed visual gags (like the pink stuffed bunny that Bear tucks in beside him, or the sagging dark bags under his eyes)—and you have a flawless rendition of Theater of the Absurd, guaranteed to invoke giggles galore from young and old alike. We repeated the sequence a few times until the two of us were in hysterics (Emily can hardly say “I stubbed my beak” without DYING laughing) and receiving more than a few inquisitive glances from fellow passengers. So there: when you give Goodnight Already!, you aren’t just giving a bedtime story; you’re giving built-in entertainment even when the book isn’t around. There is nothing as contagious as silliness. If Goodnight Already! is characterized by accelerated folly, then the charm of Where Bear? lies in its understatement. Where Davies gave us a wealth expression in and around the eyes, Henn’s crude, compelling brushstrokes communicate a depth of emotion from body posture alone. “Once there was a bear cub…who lived with a little boy.” Immediately, we know how much the boy adores his friend simply by the way he moves in relation to him. The question, repeated throughout the book, becomes, where should the boy take the bear to live? Each time, the boy addresses this question to the bear—and each time, without waiting for a response, the boy goes on to volunteer an answer. (Sound familiar? Anyone?) “‘Oh, hang on! There are bears at the zoo!’ said the boy. ‘What about the zoo?’” After a brief trial and error at the local zoo, the Bear pronounces a definitive “No.” And so the search continues: the boy offering up the circus, the toy store, the forest, the jungle, and a cave, all as habitat possibilities. My kids adore the way Henn plays with the font of the various “No”s, so that each one takes on a different sound in our own readings. Not surprisingly, the bear’s perfect new home turns out to be the Arctic. But where most boy-releases-animal stories would end there, did I mention that the two still telephone one another? Well, duh. They need to plan vacations together to catch up. Now don’t you wish you could tag along with them right about now? Put the birthday present in the mail, skip the party, and let’s go have some real fun. Review copy of Where Bear? provided by Penguin. All opinions are my own. Amazon.com affiliate links support my book-buying habit and contribute to my being able to share more great books with you–although I prefer that we all shop local when we can! One book that all the Book People will be talking about this holiday season is Abby Hanlon’s Dory Fantasmagory (Ages 5-9), an illustrated early-chapter book featuring one of the spunkiest, most imaginative, most genuinely real six-year-old girls to grace the pages of children’s literature. (After all, it was written by a former first-grade teacher.) If you really want to impress people with how in the know you are, you should buy the book this month, instead of waiting until next month, and then you should give it to everyone you know—regardless of whether it’s their birthday or not. Just a thought. It’s possible that I’ve lost perspective on this 153-page gem, because I have, by request, read it upwards of ten times to my four year old in the past month (and don’t think that her seven-year-old brother doesn’t listen in at every chance he gets). I’m beginning to feel like Dory (nicknamed Rascal) and Emily are actually the same person (wait, are they?). Both talk to themselves incessantly, invent wild fantasies in their play, wear strange things around the house, and will stop at nothing to get the attention of their older siblings. I don’t think that Emily has a bearded fairy godmother named Mr. Nugget, or that she believes there are at least seven (mostly) hospitable monsters living in our house…but then again, I can’t be sure. What I do know is that Emily, like Dory, hears things like “Stop copying me!” and “Stop acting like such a baby!” far more than I would like. And that she, like Dory, uses her imagination and her heart to win everyone over in good time. 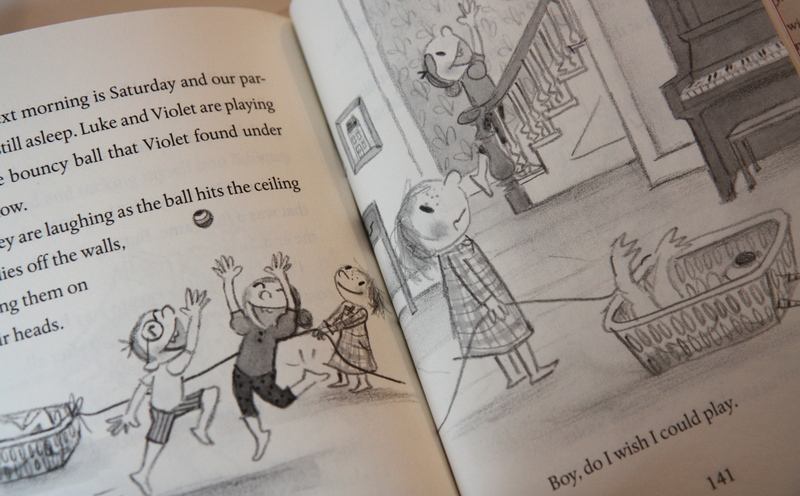 I am a huge fan of Judith Viorst’s comparable early-chapter series about the wildly precocious Lulu (which begins with Lulu and the Brontosaurus, and whose third installment Lulu’s Mysterious Mission is also on heavy rotation at our house these days). 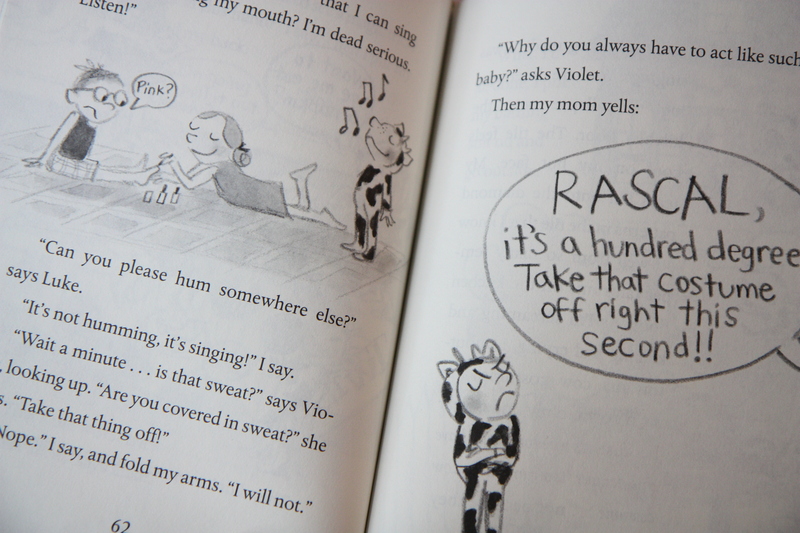 But Lulu, with her ear-splitting tantrums, her bossy rhymes, and her self-centeredness, is not exactly the kind of girl we would like to believe is living under our roof (of course, that’s Viorst’s point, and why kids find the books so hilarious). Dory, however, is always likeable to her readers. Despite what her family may think of her at a given moment, we the readers are always championing her wit, hailing her resourcefulness, and rooting for her on every page. Even when her mother is tearing her hair out—because Dory won’t break character at her annual checkup and insists on barking in response to all the doctor’s questions—we are secretly smiling at that stubbornness, that scrappiness (because, ha ha, it’s not us!). She’s good, that Dory. You’ve got to hand it to her. Undoubtedly, this short chapter book makes a highly entertaining read aloud for any four, five, and six year old; but it should also be said that, for a newly independent reader, this book moves along beautifully, is frequently broken up by exuberant childlike pencil sketches, and makes use of straightforward sentence structures (these things are rarer than you’d think in the world of early chapter books, which get very overwhelming very fast). In fact, I have this beautiful picture in my mind of Dory Fantasmagory being read by an older sibling to a younger sibling. The younger one would love it, because she’d be seeing herself on every page, and the older one might learn a thing or two about seeing the world through the eyes of The Youngest for a change. Thank you, Dory, for coming into our lives; for fighting the evil Mrs. Gobble Gracker (even if she didn’t exist in the first place); for entertaining yourself for hours on end; and for always giving one more chance to your brother and sister. Thank you, Dory. Children’s literature never knew how much it needed you. Review copy provided by Penguin Group. On a Saturday morning towards the end of summer, on our way to go swimming, we swung by our local bookstore, so that I could run in and grab a gift for a birthday party later that day. My kids waited in the car with my husband, and when I returned a few minutes later, they asked with excited curiosity, “What book did you get?” I told them that I had picked a brand new one, by Kim Cooley Reeder, titled The Runaway Tomato (Ages 2-6). “RUNAWAY TOMATO? !” they shrieked, throwing their heads back in laughter. And thus commenced twenty minutes of their regaling us with their own ideas of where a runaway tomato might come from and what it might do. Perhaps it’s because our attempt at growing tomatoes this year was such an Epic Failure, that my children think the idea of harvesting gigantic tomatoes is pure absurdity. Or perhaps there is just something innately hilarious about stories starring fruits and vegetables gone rogue (Cloudy with a Chance of Meatballs has always been a favorite of JP). Either way, we had to return to the bookstore a week later to get a copy for ourselves. As the tomato ultimately dislodges from the tractor’s hitch and takes off through the town like something out of a kitschy horror movie, there is ample opportunity for the Stuff of Little Boy’s Dreams. Police cars, fire trucks, helicopters, bulldozers, garbage trucks—if it has a wheel, it makes an appearance in this story, all in the name of trying to stop (or at least clean up after) the runaway tomato. Disclosure of Material Connection: I received one copy of this book free of charge from Penguin Group (USA). I was not required to write a positive review in exchange for receipt of the book; rather, the opinions expressed in this review are my own. And yes, I was then able to gift the second copy I purchased! You are currently browsing the Birthday Gifts category at What to Read to Your Kids.